Customer remote control for mitsubishi electric air conditioner packaging 1.Usually use PE and carton packaging,1pcs in one PE bag. 2.Or use plastic packaging. 3..According customer's asked packaging. Note: This model code is the code corresponding to your air conditioner. 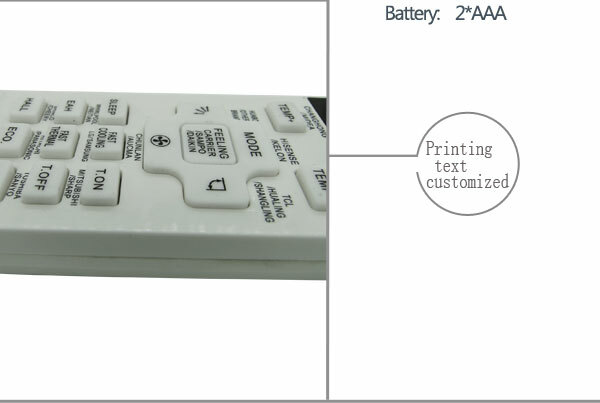 3) Press the Enter key, the model code will stop flashing, and the setting is completed, so the remote control can remotely control the air conditioner of your choice. Find the code → turn on the air conditioner power → press the “Settings” button continuously → the model code is in the “Model” window. Blinking → Press the Enter key to confirm → The model code stops flashing → The setting is completed. 1. The remote control does not increase the functionality of your air conditioner. If there is no wind direction function on your air conditioner, the wind direction button of the remote control is invalid. 2. The remote control is a low-consumption product. Under normal circumstances, the battery life is 6 months. If the battery life is shortened, replace the battery with two sections. Do not mix old and new batteries or different types of batteries.